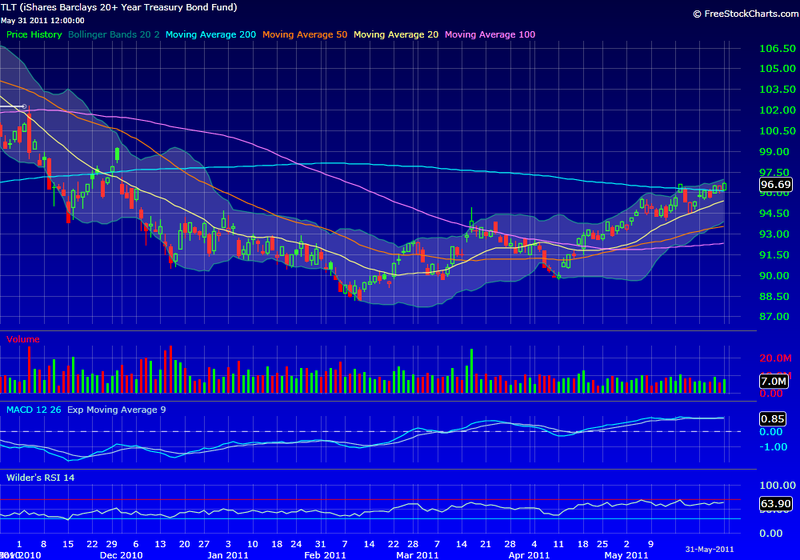 US Treasury Bonds are a buy here. At least that's what the charts are saying. As the market focuses on the end of QE2 the chart for US bonds is one of the prettiest I've seen recently. The iShares Barclays 20+ Year Treasury ETF (TLT) is breaking above its 200 day moving average and all signs point to higher prices. The fact that all the "smart money" has avoided bonds, and many are actually short, this technical breakout could see an acceleration of buying in the near future. Initial target is the Nov 30 high of 99.27, then 102. The picture looks bullish as long as price holds above its 20 day moving average (currently at 95.54). I tweeted my long entry last week at 96.30 as price started to break above the 200dma.